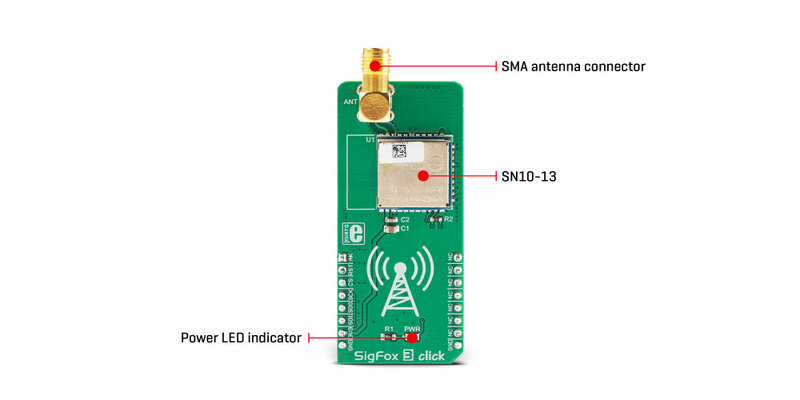 The SigFox 3 click is a device which carries the SN10-13, a fully integrated Sigfox™ certified module by InnoComm, allowing connection to a low power wide area network (LPWAN) that enables communication utilizing the Industrial, Scientific, and Medical (ISM) radio frequency band. 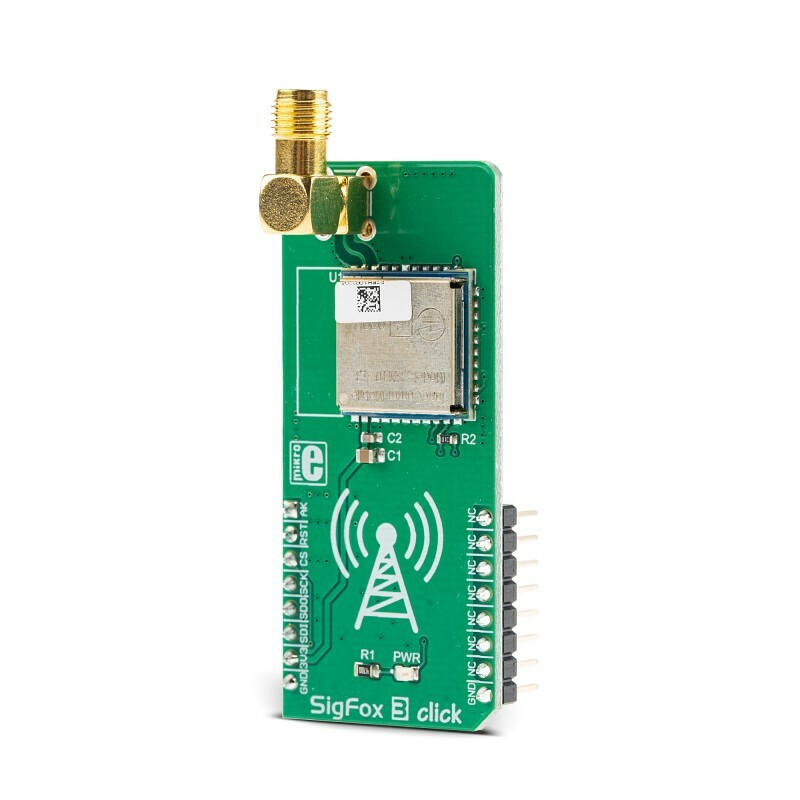 The SigFox click comes with the subscription to the Sigfox network for a duration of one year from the moment of activation. Note: Sigfox 3 click is intended to be used in the RCZ3 (Japan). Activate your Sigfox 3 click by using the ID and PAC numbers which you can find on the package box of your SigFox Click board™. Find out more about the Sigfox network coverage and other related information. 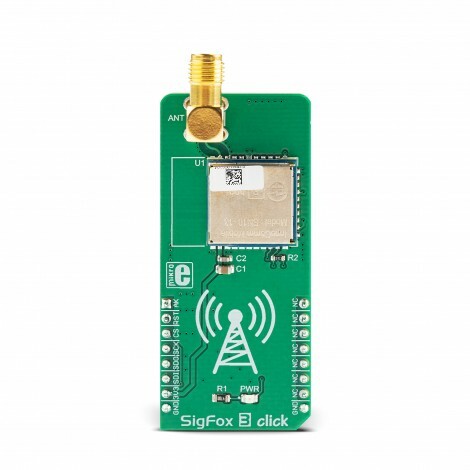 Learn about the next steps for setting up the Sigfox connection. The Sigfox network is a star topology network, specifically designed for the Internet of Things (IoT) applications. It uses an ultra-narrow frequency band, able to penetrate through the objects and cover large distances, making it a perfect choice for various industry-specific applications, such as the sensors networking in agriculture. 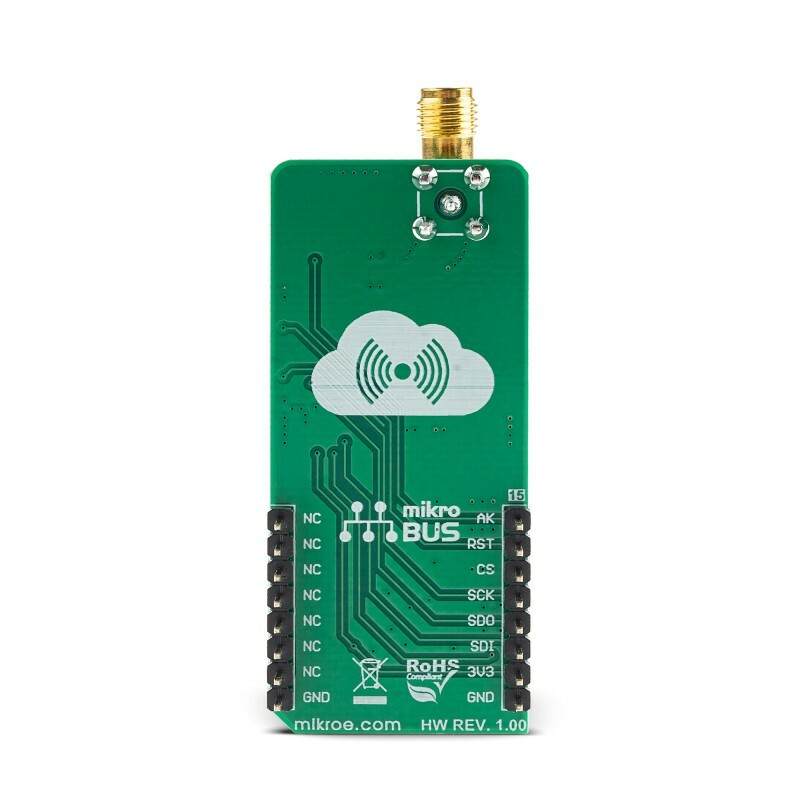 This Click board™ offers all that is needed to integrate a Sigfox network connectivity into a design. 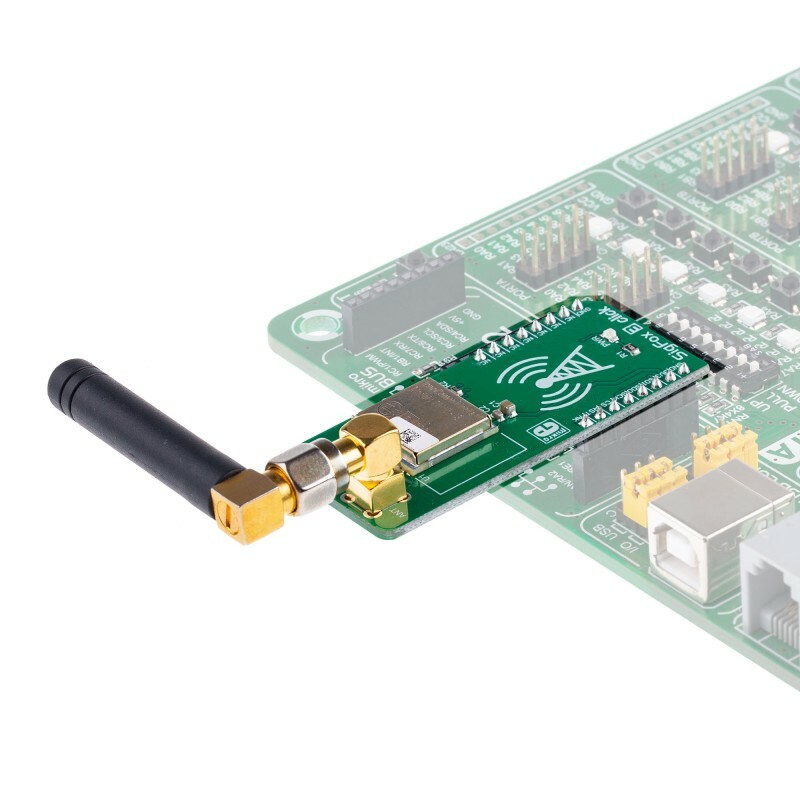 Besides the SN10-13 module itself, it offers the industry-standard SPI communication protocol and an onboard SMA connector, used to connect the appropriate 868MHz antenna. With its low power consumption, SigFox 3 click can be used on a battery-operated platform for a very long time, without replacing the battery. The SigFox 3 click offers all that is needed to integrate a Sigfox network connectivity into a design. Besides the SN10-13 module itself, it offers the industry-standard SPI communication protocol and an onboard SMA connector, used to connect the appropriate antenna. With its low power consumption, SigFox click can be used on a battery-operated platform for a very long time, without replacing the battery. The Click board™ is equipped with the SN10-13 Sigfox™ certified module, manufactured by InnoComm Mobile Technology Corporation. The hearth of this module is the NXP OL2385, a sub-GHz wireless transceiver System-on-Chip (SoC). The communication between the SN10-13 module and the host MCU is performed over the SPI. An additional AK pin is used to signal the command acknowledgement. There is a number of commands available, which are all sent in a specific format. Each data packet transferred via the SPI bus contains the number of bytes to be sent, the command itself, and the data payload (if there is one). Upon the successful command, the AK pin will indicate the response. This pin is routed to the mikroBUS™ AN pin. In addition, commands return the status over the SPI. If a command is successful, a status of 0 is returned, for example. Different status responses have different meaning. Some commands may return various error codes, indicating a certain condition of the signal chain. For example, a command might get accepted by the module, but refused by the remote base station (station not reachable, and similar). All the commands are a part of the firmware API offered by the module, over the SPI interface. However, the library which comes with the SigFox click contains functions that encapsulate all the necessary commands and handle the responses, offering simplified programming interface, in the familiar MikroElektronika compilers environment. The module can be reset over the RST pin of the mikroBUS™. This pin is pulled to a HIGH logic level internally. Setting it to a LOW logic level will perform a hardware reset of the SN10-13 module. The Sigfox network operates using a public frequency bandwidth, defined by the regional radio regulations. Sigfox SN10-13 module is verified and Japan MIC approved. In the Japan region (RCZ3), the Sigfox network operates at 923MHz frequency band. This network is a star topology type of network and requires a base station which collects the data from the connected nodes and sends it to the Sigfox cloud for further processing and distribution. The nodes can be as far as 1000m from the base station, depending on the regional Sigfox network frequency (the official information about the network coverage can be found on the Sigfox site). Node objects can be various temperature and humidity sensors, parking lot sensors, etc. The node objects communicate with the base using the Differential Phase Shift Keying (DPSK) communication method. Small messages with the data payload as low as 12 bytes are transmitted several times per day, allowing conservative power consumption. The ultra-narrow frequency band allows the TX power to stay really low, saving even more power and allowing batteries to last a few years. This is very well suited for various industrial applications, such as the agriculture industry, where many sensor nodes are often scattered over a wide area and are hard to reach for a frequent battery replacement. Once it collects the data, a base station will decode it and send it to the Sigfox cloud. The data is processed and pushed back to the user application. While the uplink (information transfer from the node to the cloud) is performed using the more robust and efficient DPSK communication method, the downlink (information transfer from the cloud to the application) uses the Frequency Shift Keying (FSK), which is less robust than the DFSK and uses broader frequency range. Typically, the interference is not a big concern for the downlink. The key difference between similar, cellular network based IoT network solutions, is that all stations in range will pick up the node signal and forward it to the cloud, not just a single station. The Sigfox cloud is unique and all the base stations are connected to it. This type of centralized approach can have some inherited benefits. For example, it is possible to track goods, by accessing data sent by another station in a different part of the country, or even a different country. With its global Low Power Wide Area network, Sigfox is a true Internet of Things. This table shows how the pinout on SigFox 3 click corresponds to the pinout on the mikroBUS™ socket (the latter shown in the two middle columns). We provide a demo application for SigFox 3 Click on our Libstock page, as well as a demo application (example), developed using MikroElektronika compilers. The demo can run on all the main MikroElektronika development boards. The library contains basic functions for controlling the click board. int32_t sigfox3_init() - Function for initializing the sensor. int32_t sigfox3_wakeUp() - Function for waking up the sensor from the sleep mode. int32_t sigfox3_sleep() - Function for placing sigfox to the low power mode. Click board wakes up from sleep. Some tests are performed. After the tests and after the data has been sent and received from the network the click board is placed into the sleep mode to its low power mode. All events that are executed inside of the application task are printed to the serial port.